(Note: the first part of this journal was written just after my return from Ghana. This is a mixture of my journal entries and memories. Life back in America has been busy… all good stuff! I am missing my relaxed pace of travel. It seems to take a plane ride for me to sit down and write). Please forgive my delay posting this Ghana journal continuation. (At least my Mom is waiting in anticipation for the next entry.) Life has been full … Summer is definitely one of the best parts of being a teacher (no offense, kids) … I’ve been free to roam about the planet, and have had non-stop activity in the last weeks… camping with friends in remote Northern California, seeing stars that even rivaled the best of my life seen from a mud hut roof in Saru, Ghana, biking at least 150 miles around New York City, catching up with dear friends, a Brooklyn choro roda, gigging and jamming in Manhattan, and a great trip to North Carolina to visit family and celebrate my Grandmother’s 90th birthday with a big family reunion. I also completed all the work to order the CD I recorded with Ian Faquini (!!! ), and translated 70 pages of musical equipment information into Portuguese, in the cracks of time. So, there was no time to write until now, when I find myself on a plane on my way to another gig in upstate NY. Finally, I will allow myself the pleasure of piecing together my scribbled journal entries, photos and memories, and return to Ghana in my imagination. As I mentioned in the last journal entry, Kofi, our amazing leader of the first-ever ORFF-AFRIQUE workshop went above and beyond expectations to educate us, entertain us, keep us healthy, and include us in the community. The first week we spent in Dzodze, and the second in Ho, both in the Volta region. Every day we studied various aspects of traditional music of the region: interlocking drum, bell and shaker patterns, the Gyil xylophone, the Atentebe flute, beautiful songs and energetic dance. If you want to learn more about the styles and rhythms please contact me, and I’ll point you in the right direction. (East, from where I am right now). I’m looking forward to delving into this rich musical material with my students, and continuing to experience the music. Teaching can be a great way to learn something. I have much work to do to sift through my notes and videos and prepare lessons, so I will enjoy spending time with this music again very soon. At night, every night, we had the joy of witnessing performances by different community groups. The impressions left with me are of extreme enthusiasm, vibrancy, life and humor living inside wonderful joyous people, expressed through dance and music. Dance movements were rooted in tradition and had meaning. There were several moments in dance performances that were flat out hilarious. For example, a couple scenes in different dances included power play between men and women danced with humor… I’m still laughing about the scene where some women dressed in grass skirts dumped water on their men after a danced dramatized argument. I love this kind of communication: without verbal language, we can still understand universal themes, and make each other laugh. Intricate, colorful costumes matched the specific dances being performed. Even the typical everyday clothing in Ghana is beautiful, handmade, and vibrantly colorful. We had several opportunities to see the art of textiles in action. Kofi’s wife arranged for clothes to be made for those who wanted to buy them… It was hard to choose between all the beautiful cloths the women brought … I ordered two dresses for myself, and some shirts for gifts. The seamstress measured us, took design choices, and came back in two days with perfectly sewn clothing for dozens of pieces… expert work. In Ho, Sofia, had the idea to take us to see how the cloth is dyed in patterns. We saw how they heat wax, and apply it to cotton with foam patterns. Later, when the cloth is dyed, the dye doesn’t take where there is wax. Through this process they can create beautiful designs. On the same trip we visited weavers, working on traditional looms. The clickity clickity clack of many spools moving back and forth inside little wooden boat shaped holders, sounded like the chirping of Cicadias to my ears. I ended up adding some weight to my suitcase that day. The Sunday in the middle of the two weeks of the first ever Orff Afrique, we visited two very interesting and different religious gatherings. The similarities between the two were endurance, fervor, and the beauty of ceremony. The morning found us at a Christian church. I grew up in a diverse church with Gospel music and currently play at a gospel church in Oakland, so personally this church service reminded me of home. The service was held in a half completed concrete building with a roof, but no walls. The air flowed through the space carrying the sound of of the church’s nearby children’s group. There was a band, a choir, and everyone dressed beautifully in their Sunday best, especially a delight to see when everyone left their seats and started dancing in the aisles. The sermon was long and twice as long being translated between Ewe and English…. The service itself was over two and half hours, and kept going even after we left. One of the most memorable and vivid experiences of my entire Africa trip was that entrancing afternoon at the traditional religious ceremony. When we arrived, we asked to change into traditional clothing. Us women wore the brightly designed kente cloths around our waists and tops with our shoulders bare. The men just wore the same cloth around their waists, with bare chests. We all went into the ceremony area barefoot and without any possessions. When we arrived, the drummers and dancers were in full swing. They never stopped while we were there, and kept going as we left. It was a full non-stop day of ritual. We were warmly invited into the circle where the drummers were playing with full energy, and a group of dancers and singers rejoiced in the middle. There was a boy off to one side and a woman with a jug of water on her head who were already in a trance. Their eyes were moving around wildly, closed, or rolling back in their heads, and they were moving in strange ways. The boy stood still for a long time with his arms outstretched while the woman danced around wildly and frenetically. At one point the male leader of the singing suddenly let out a James Brownesque exclamation, “ow” and lept away from the steady dance steps of the circle with wild fast movements. He then fell on the ground. He lay there motionless for some time, then just as suddenly as he entered trance, jumped up and ran with failing arms into a special ceremonial hut. He came out covered with white chalky designs on his face and with a glass bottle in his hands… he came towards us and smashed the bottle on the ground right by the feet of our Argentinian friend Fabian. No one seemed alarmed (except Fabian). A woman simply quickly swept up the broken glass. The man continued to shout jubilantly and dance with large motions about the entire area. The drumming was continuous and always energetic. I was invited to drum, and also danced, but not with total abandon… I really didn’t know what would happen to me if I got too into it. There was a deep spirit alive in that place. Something beyond what most people experience in daily life in mainstream Western culture. It was fascinating to see and feel ancient traditions in action … the possession of people by spirits. I palpably felt as if I was in the midst of something connecting the dead and the living. That Sunday evening we traveled by bus to Ho, our home for the next week. We continued with our studies of the drumming, xylophones, songs, and dance. It was here that our Gyil (Ghanaian pentatonic xylophone) teacher, SK, brought a couple dozen newly made Gyil for us to practice on together. 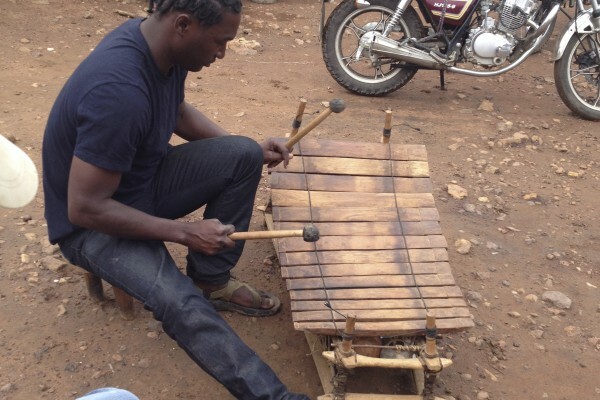 These fascinating instruments were traditionally only played at funerals Ghana. SK’s father helped bring the instrument to an artistic role in the community. Usually they are played one at a time… this was the largest collection of Gyils together at one time ever. The sound of the buzzing instrument is amazing. Fifteen wooden bars are strung together by string between poles of a wooden frame with resonating gourds suspended underneath the bars. Each gourd has three holes covered traditionally by spider egg sacks, but now with postal tape. The vibrating of these tiny diaphrams makes the buzzing sound said to represent the life inside the instrument. I really enjoyed playing the Gyil for the captivating sound and for the physical challenge of remembering patterns with the unmarked bars. While in both Dzodje and in Ho we got to witness performances of Kofi’s brainchild and labor of love that shares a name with his youngest daughter. The Nunya Academy is a program for children and teens to study instrumental music. We heard remarkable, fully memorized pieces by students playing saxophones, clarinets, trumpets, trombones along side the traditional drums. Two of our musical guides, Prosper and Benzola in our journey are mentors for the Nunya Academy. The academy is currently free for students and made possible by the generosity and volunteering of Kofi, Benzola, and Prosper. The instruments Kofi bought and collected by donation in the US and Canada. The amount of work and care that has gone into giving these students such a wonderful opportunity is clearly evident when you see and hear the Nunya Academy ensemble playing with amazing skill, spirit, and enthusiasm. I was blown away by the young wind players’ dedication to music. I loved the two young flutists, and was able to give them a few lessons on fingerings, tone and posture. I hope to stay in touch with them and see them grow. One of the main take-aways for me from learning about the Nunya academy is to not take for granted the musical education opportunities and instruments. Music education is precious, fills a very important social role and developmental role for children. Music education is worth fighting for. Some of the most beautiful music we heard was a choral group that came to sing for us during our stay in Ho. The traditional Ghanaian rhythms and songs set into 4 or 5 part harmonies are gorgeous. We studied the history of choral music in Ghana and had the opportunity to sing several arrangements together. It’s nice being in a room full of music teachers at a moment like that. The sound is still ringing in my ears. 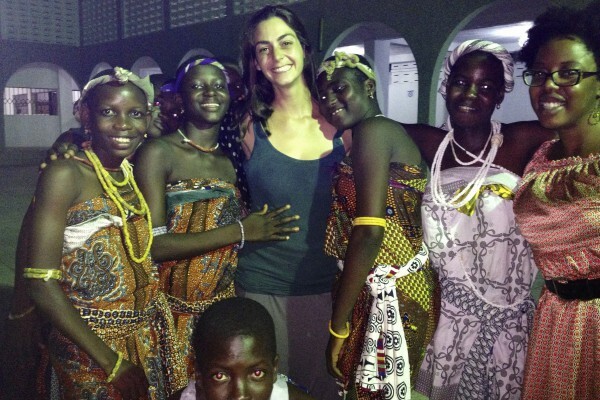 We left Ho and headed on a fun trip across Southern Ghana to Accra for one night. My favorite part of this brief city stay was a late night outing with SK, his wife Mollie and fellow student Russell. We went to an open-air bar and music venue where I ended up jamming piccolo with a fun dance band. It was a great lively night scene, sweet in the warm evening air. The next morning we headed to Cape Coast and Elmina, which I wrote of in my previous journal entry. I enjoyed the coastal beauty, and as difficult as it was, it was good for me to stare the truth of the past in the face. It gave me a broader understanding and historical context of the realities and severity of slavery. That evening our group all had a sea-side dinner together at a hotel near where co-student Julie and I decided to stay. Both of us were staying in Ghana extra time to explore, and decided to start out together. We stayed at One Africa wellness center, where I wrote, practiced, and just unwound from a full two weeks of learning and activity. Ahhh… it felt like a vacation. I made few local friends. After resting a couple of days, I went with Julie to Busua, another beach town with surfing for her, and a room for me that was so close to the ocean, it was on the sand. In one loooong day, I left Busua alone, caught a tro-tro (hot sweaty bus that waits to be full before traveling) across the south of Ghana to Accra, visited and jammed with Colter a musician who is a professor at the University in Accra, then ended up at Mollie’s and SK’s house where I relaxed for about five minutes before realizing that I would continue my adventure that night. SK was returning to his hometown, about to show up.. running late for the bus, and I decided spur the moment to travel with him to visit the place he grew up learning the Gyil. I repacked my page in 60 seconds, and Mollie sent me with a yoga mat for sleeping and advice to pick up water I arrived in time to get the last “seat” on a bus going to the same place as SK, but on a different bus. I quickly bought some bottles of water, and stepped onto the bus, to the hurried calls of the driver who then handed me a cushion. I was to sit on the floor next to him for the 12 hour bus ride. Four men were also standing in the doorway section of the bus.. After 8 hours, someone got off and I got a real seat. It was a long bumpy night, but believe or not, eventually worth it! Once I arrived in the little town of Tuna at 9am, I sat by the side of the road waiting for SK. Suddenly I see him ride up on a motorcycle! We packed ourselves and a large bag of presents for his family onto the back of the motorcycle and rode up a bumpy dirt road for over an hour. Sometime as we passed people in the road who would point, stare and and wave at us. At one point, we passed a school and a bunch of children followed after us yelling “obruni, obruni!” Obruni means foreigner, but with no negative connotation. I stuck out … but didn’t mind.. I only felt curiosity and kindness directed towards me. We stopped at his sister’s village to visit and so SK could get a little work done on his motorcycle. I took a sponge bath to clear the sweat from the heat of the early day. Once in this area, no one spoke English, so I communicated through hand gestures, and by playing the flute. I started playing and all the children from nearby homes came running to see what was happening. Suddenly I had a little crowd of listeners smiling and laughing at me. Even though we couldn’t speak any words of the same language, I felt I had made friends. more pics next time too! Hope to see you tonight in LA at the blue whale!